Our noon analemma sundial is a solar calendar. Each day the sun's path across the sky is a little higher or lower, depending on the season, than it was the day before. The rays of the sun passing through that south-facing circular window (and through the aperture in the pointer in that window, called a gnomon), casts a bright spot on the floor of the info-sculpture. In the days leading to the summer solstice the spot moves closer and closer to the south wall (each day the sun is rising higher in the sky), and as we move into winter it works its way up toward the north banco (lower in the sky each day). The "lopsided 8" design in the floor of the info-sculpture is called a NOON ANALEMMA because it is derived from the path of the noontime solar spot throughout the year. See it for yourself! Note: While observing this sundial, please keep in mind that you should never look directly at the sun even with darkly tinted films or glasses. Doing so could cause permanent damage to your vision. The sun is highest in the sky during the summer. From May 1st through August 10th the high angle of the sun will cause the sun spot to fall on the sill of the kiosk rather than on the floor. The sinuous red ribbon separates Standard Time from Daylight Savings Time. The top portion of this analemma above the red ribbon represents the sun spot's location at one o'clock clock time (Mountain Daylight Time), and the portion of the analemma below the red ribbon is the sun spot at twelve noon clock time (Mountain Standard Time). The blue line is the noon mark for Cerrillos: Cerrillos Mean Noon. Cerrillos and the kiosk are not located in the center of the Mountain Time Zone, but are about 63 miles west of that center. 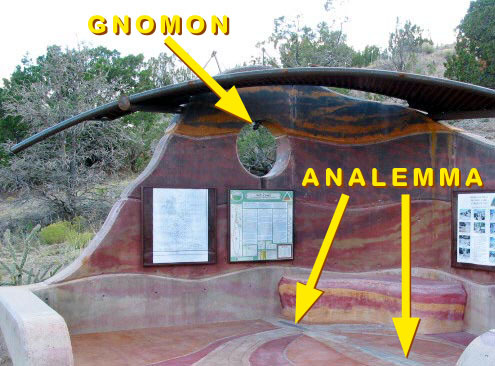 Therefore, the position of the sun at Mountain Time "clock midday" in Cerrillos is slightly east of overhead, and the noon analemma path on the floor of the kiosk is slightly west of the Cerrillos noon mark (the blue line). The sun spot produced by the gnomon will reach the Cerrillos noon mark about 4.5 minutes later. The sun "souths" (or Cerrillos has its local noon) four and a half minutes later than your mountain time clock says it is noon. If you understand all of this then you have a potential excuse the next time you arrive somewhere a little late. "What do you mean, I'm late? According to my local analemma I'm right on time."